When pluging the DJ controller to a computer, the lights of the controller switch on and off to form a light show called Vegas Mode. It shows which keys are backlit, it animates your booth in a party when you stop DJing, and it can also be used in your Youtube videos. - control Djuced 40 sample decks, deck C and deck D, on P32 DJ. Connect the 2 DJ controllers to your computer. Click on the Gear icon to reach Djuced settings. Select P32 DJ in the list, and click on Next. 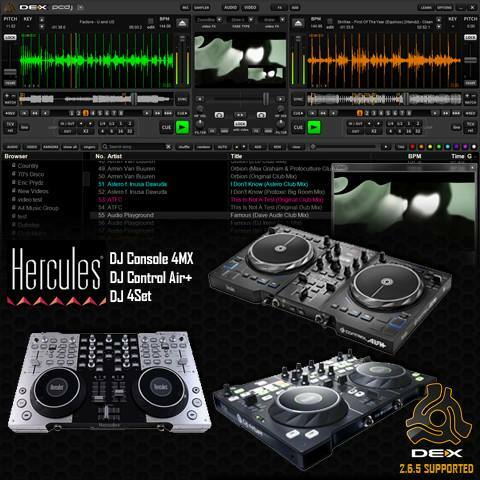 Select Hercules P32 DJ Mapping Extended, click on OK.
- Deck C and D (sample decks) on P32 DJ. Anaheim, California – January 19, 2017 – Spearheaded by Hercules, a leader in mobile and professional DJ equipment, the DJUCED™ teams are thrilled to announce the company’s new enhanced version of their pro DJ software DJUCED™ 40° 3.5 at NAMM 2017. A big part of the teams’ strength lies in the importance they place on listening to their user community when it comes to making improvements in DJUCED™, as was the case with the Sample Editor, and responding to the new expectations that have emerged from the base of 500,000 licensed users. One of the most important aspects for DJs – the ability to view the tracks that they’re working on as precisely as possible – has been taken into account in DJUCED™ 40° 3.5. To make things easier and more comfortable for DJs, the interface automatically adapts to all screen resolutions from 1024 x 600 right up to 4K displays. What’s more, thanks to the new high-resolution waveforms, DJs can use a high-level zoom – with single-sample accuracy – with 6 different vivid color schemes available to enhance viewing precision and speed, and for better interaction with the DJ. Instantly view the beat alignment between “Master” and “Deck” for easier beatmatching with this new visual tool. Discover even more great improvements! The “Smart Mix” Automix feature can be used directly from the DJUCED™ 40° 3.5 file explorer. This feature helps users find the best-matching tracks to be played, in terms of BPM and key. Vinyl Torque is an innovative new emulator that lets users feel the weight of real turntable platters, and use the “Brake effect”. And last but certainly not least, improvements to the Scratch feature in DJUCED™ 40° 3.5 now ensure optimized compatibility with the Hercules DJControl Jogvision controller! The new DJUCED™ 40° 3.5 update is be available for download since January 19, 2017 – in the Downloads section at djuced.com. Djuced team has released its October sample pack for Djuced 40, called Organic. - an DJ controller whose audio interface has 2 stereo inputs supporting phono level if the DJ turntables have a phono output level, for example a Hercules DJ Console Rmx2, 4-Mx, Rmx, Mk4 or Mk2. - Or you use an analogue mixer: you then use the mixer instead of the central controls of Hercules DJ Console. - your turntable on left side now controls the left virtual deck, your turntable on the right side now controls the right-side virtual deck. Traktor team has released Traktor Pro 2.8.1 and Traktor LE 2.8.1. The users of DJConsoleRmx2 Premium TR can download Traktor LE 2.8.1 from Native Instruments website. and benefit of 2 new features of Traktor LE 2.81. Definition: Traktor LE has now a 64-bit architecture to access all the available RAM on computers with 64-bit operating systems, instead of accessing only to 2GB of RAM on the previous Traktor release. Result: The access to more RAM allows Traktor Pro to manage of more items (larger Track Collections, better playback caching, etc.). Definition: The “Parallel Processing” mode lets Traktor Pro use multiple threads to analyze several tracks simultaneously. Access: This option can be activated at the bottom of the Analysis window you get when right clicking on tracks and choosing “Analyze” from the context menu. Target: Processing large collections of files is faster with this option enabled, but more CPU consuming, so it should not be done while performing but in an offline situation. - in the list, click on download button on Traktor LE 2 line. Remark: Traktor LE 2.81 is not supported in Mac OS 10.8. VIRTUALDJ: Hercules mixing controllers are compatible with the new VirtualDJ 8! Following the release of VirtualDJ 8, we are pleased to announce that most Hercules mixing controllers are compatible with this new version of the popular VirtualDJ mixing software. As Hercules controllers are Plug and play, they are automatically recognized by the software without the need to install new drivers. Click here to view the official list of mixing controllers compatible with VirtualDJ 8, and download the advanced operation guides for the Hercules DJConsole RMX2 , Hercules DJControlWave and Hercules Universal DJ controllers by clicking on the corresponding links. Check out other news regarding VirtualDJ 8 on the official Facebook page . Wired headphones are generally recommended for DJing since wired headphones have no latency, while most bluetooth headphones have a latency which can disturb the DeeJay operations. Bluetooth speakers can be used in DJing to play the music for the audience : bluetooth latency is not disturbing for the audience. - and wired headphones for the DeeJay preview. 2) If your audio interface control panel has a menu to set the headphones on the channel 1-2, set the headphones channel on 1-2. - second, your audio interface device. - preview your mix in your headphones. 2) nor use the output 1-2 of your audio interface to play the mix on wired speakers: your master output is your bluetooth speaker, while the output 1-2 of your audio interface plays the preview. DJConsole Rmx2 with premium kit takes advantage of DJConsole Rmx2’s audio excellence & eye-catching design. A style kit, to change the controller’s look and enhance its visibility in dark and low-light conditions. 1 headphones plug adapter (1/8" female stereo to 1/4" male stereo) : to plug headphones on Rmx2 headphones outputs. yellow caps, whose sharp contrast on the black overlay shows the controls positions even in low light condition. DJConsole Rmx2 Premium TR comes with Traktor LE 2.